The entire city is in holiday mood now and the preparations for celebrations are on in full swing. You could sense the presence of green and red donning most of the shopping malls and the familiar Christmas Tree is indicating the imminent coming of Dear Santa. Well, the year is about to come to end and everyone in on top of their plans to complete the week and leave for a vacation. Yeah not everyone but I hope most of us have planned some time away from work. This is the time when most parts of the world, if not all, are generous in according vacations or leaves to employees. After all, it is the time to put to rest all the toils of the year going by, sit back, relax and freshen up for newer challenges. While emails are being flooded with warm wishes for the holiday season and leadership at office advising to take a good break - one line stuck me in one of those messages - this is also a good time to reflect on the year gone by, relish on your accomplishments and learn from mistakes. This may be getting a bit philosophical, but I decided, why not at least take up a part of it - reflect. I am not sure of you, but I am definitely looking forward to a good break - especially after all this traveling that the last couple of months have seen. While I am snuggled in my quilt and sipping on the steamy coffee to avoid the chills of the season - come on who am I fooling when I am writing this from the 21st-floor office looking at an awesome view of the city of Abu Dhabi splashed with the first rains of the season - here is what comes to mind when I look back at the year, going by. New Beginnings is special and hence was this vacation. We decided to welcome the year 2017 in the beautiful valleys of Uttarakhand and took off to Nainital. The week-long vacation was all it was supposed to be - laid back, relaxed, luxurious and scenic. We spent the time enjoying the chills of the hills amidst the peaks and the valleys and grasped the nature to the best possible potential. The grand 2 bedroom accommodation overlooking the Naini Lake was just the start of the good things that this year offered to us. We had planned the time with minimal sightseeing and most the time was kept to lay back and take the moment slowly. The celebrations on the Mall Road - the primary arterial road of the city - were lively, musical and warm (even on that chilly night). Well, it was almost perfect until the D'day. The new year brought with it a hail fall - the first for us and it did turn the holidays into one of the memorable ones for us. Well given the travel buffs that we are, most of our memories and events tend to include some bit of travel and so did this. An anniversary is a perfect opportunity to snuggle out the city and cherish the time spent together away from the world. We were surely not ready to miss this opportunity and spent the entire fortnight in one of the most exotic regions of the country - the North East. If you are inclined to say, what's so exotic about it, try attaining an altitude of 18000 feet above sea level, thrice in a week. On top of that, take snaps with Chinese Tourists when they are still in their country, touch and go with the clouds and exploring cultural intricacies at one of the oldest Buddhist Monastery. This part of the country is nothing short of a dreamland and definitely worth more than the time we spent there. We brought in the day marking the completion of 2 years at a small village called Lachung - one that was scenic and peaceful - all that was to be heard were hymns from a monastery, flowing water of the river by the hotel and occasional creaking of an old wooden bridge. Did we revive our vows - not literally given both of us - okay mostly me - being the lazy beans that we just decided to carry forward the existing ones to the next year. It was almost the mid of the year and it was a birthday - perfect time for sneaking out for yet another vacation of the year. We had already been to hills quite a lot this year until then and hence it was time to opt for beaches. This was special given both of us had not been to the top of the list destination of India until then - Goa. Yeah, Goa was where we spent the entire week with plenty of time to lazy around the beaches - there are definitely a plenty of them, visiting the Churches that showcase the cultural history of the city and then doing nothing for a lot of time. A rental car, camera, a small backpack and loads of food - this was our vacation gear on this trip. Heading out at the slight notice of our senses and immersing into curvy roads donned by thick greenery on sides was the kind of adventure this holiday provided. From the party scene of North Goa to the luxury of South - we experienced Goa, deeply, thoroughly and plentiful. At the end of which, we are still sure that it has so much left out waiting to be explored. 4. Stepping up professionally - Being a "Manager"
Well enough fun on the personal front and it was that time of the year that is like Shaadi Ka Laddo - while every employed professional dreads the "appraisal discussion" but is still waiting for it with bated breath. I had definitely put in quite a lot of work, had networked enough, made people heard about me and had everyone around me cheering but was still not sure of what that discussion would bring out for me. I walked into the room tense and anxious and walked out walking. While most such discussions leave you with a number to be happy or sad about, mine was a binary "True" - to the question if I had been promoted. Yes, that meeting left me being a "Manager" - a milestone of sorts - one that was going to bring with it a lot of challenges and harder work ahead but it still left some sense of satisfaction - of being recognized for the work done and being appreciated for it. The end of the year brought some amount of travel with it but this was not the usual one. It was not a vacation that I was heading to but for work. A client engagement needed me to be there (or here) in the region called "the Middle East" and I have been traveling on and off. I have already spent a couple of months in this country. Now whoever knows me would realize that all work is not what would describe me in a new country and so I did escape to some tourism and did gain some depth in the cultural and traditional heritage of the country, explore the iconic sites of the city and grasped an outlook of the region. Well, that is not all. The year going by has definitely had one more memory left to cherish and that is still something I am keeping away from you. The year is still on and hence things are still up and so are the secrets. 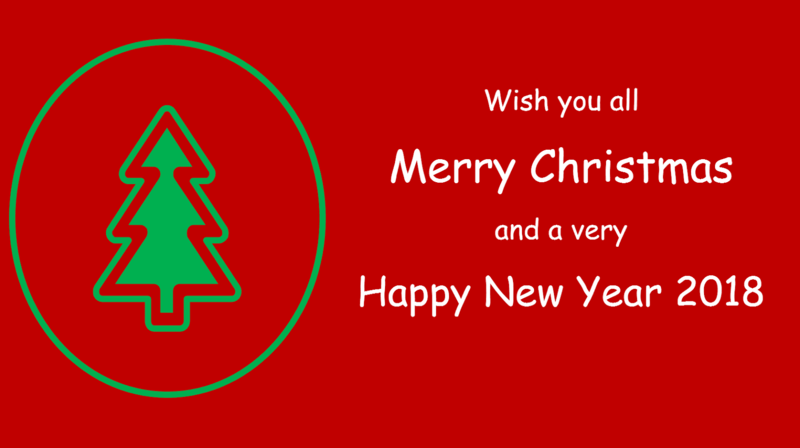 But in the meanwhile, wishing every one of you Merry Christmas and a Very Happy New Year 2019. Hope the holiday season provides you a much-needed break to spend time with family and friends and the new year brings with it hopes and prosperity. Enjoy !!! !